A bird's eye view of SpaceX's first Falcon 1 rocket poised for launch atop its pad at the firm's Kwajalein Atoll launch site. A privatelaunch firm has scrubbed its third attempt to make the inaugural launch of its Falcon1 rocket after problems cropped up during a planned engine test, thecompany said late Thursday. 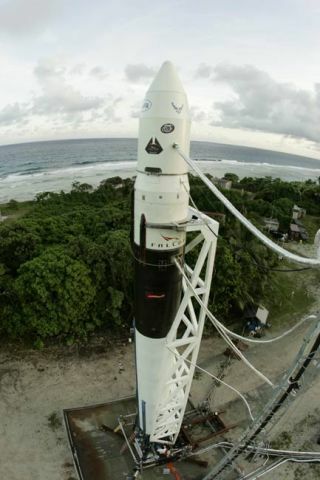 The ElSegundo, California-based firm Space Exploration Technologies (SpaceX) hoped todebut its first Falcon 1 rocket in a Feb. 10 space shot from its equatoriallaunch site at Kwajalein Atoll on the Pacific Ocean. But after a day of systemand vehicle tests, the firm stood down. "Itlooks like we are scrubbed for two weeks," SpaceX founder ElonMusk told SPACE.com late Thursday in an e-mail message. "However, weare going to try and static fire tomorrow, since we still have that dayavailable from the range." SpaceXofficials planned to test fire their rocket's Merlin 1 engineand test other systems associated with launch Thursday, but those checks wereapparently not satisfactory for a Friday launch. Over the next few weeks,SpaceX engineers will lower the Falcon 1 rocket from its launch stand give it athorough systems check, Musk said in an update posted to the SpaceX website. Thursday's announcementmarked the third launch scrub for SpaceX's Falcon 1 debut. Flightcontrollers scrubbed two previous launch attempts in late 2005 due first to computerand vent valve issues, then later to a pressurizationvalve glitch that allowed a portion of the rocket's first stage to buckle. Thisweek, the launch date was pushedback two days to allow additional time for checks and the engine firingtest, SpaceX officials said. Musk said suchhiccups were to be expected with the debut of any new launch system. "I don'tthink the research and development really stops until you've had a few launchesor at least a few countdowns so you can refine the process," he said in anearlier telephone interview, adding that each launch attempt brings valuableexperience to the SpaceX flight team. "There is a lot of development and improvementthat goes on with the process of the launch operation itself." The Falcon1 rocket is the first of a family of launch vehicles planned by SpaceXofficials to deliver satellites and other payloads into Earth orbit. Standing 68feet (21 meters) in height, the booster is designed to generate 77,000 poundsof thrust and launch payloads of up to 1,256 pounds (570 kilograms) intolow-Earth orbit. The rocket's first stage is designed to parachute back toEarth to be recovered and reused in future launch. SpaceX officials said eachflight carries a cost of about $6.7 million. Therocket's payload is the $800,000 FalconSat-2, a cube-shaped satellite thatmeasures about 12.5 inches (32 centimeters) per side. Built by U.S. Air ForceAcademy cadets, the 43-pound (19.5-kilogram) spacecraft is designed to measurespace plasma and is part of a program sponsored by the USAF and the DefenseAdvanced Research Projects Agency (DARPA). Theinaugural Falcon 1 launch is expected to be the first of up to three plannedSpaceX missions this year, Musk said. A second Falcon 1 rocket is slated tolaunch from the firm's Vandenberg Air Force Base launch site in California, while a third is scheduled to launch from the firm's Omelek Island pad on the Kwajalein Atoll, he added.